The plan is to have wagilia (traditional polish Christmas Eve dinner) at sunset PST on Christmas Eve. 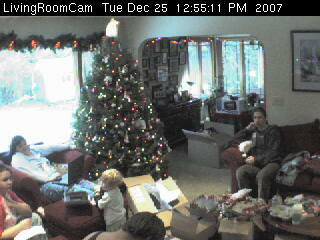 Then our extended family will arrive for limited present opening. Christmas morning will be our traditional family present opening followed by a pleasant day of sitting around enjoying the peace of Christmas Day. Come and join us. The family will be over today to decorate the tree. It looks a lot better with lights on it. Speaking of lights, the Christmas Tree Angel and the garland lights can now be turned on and off. Remember to press ‘reload’ to see a new picture (another thing I might fix this week). Merry Christmas all! Sorry there have been times that the pictures haven’t been updating. I will keep an eye on it. The tree is not going up today. Family can’t come over to decorate the tree so the plan is now to put up the tree sometime this week and then have a big gathering next Saturday to decorate it. Stop on by and turn the angel on and off. Looks like Sunday will be the day for putting up the Christmas tree and doing the Christmas cards. It’s almost here. It’s time for Christmas and so it’s time for me to get ChristmasCam working. You can again turn the lights on and off and, soon, there will be a Christmas tree to view. Merry Christmas to you all! 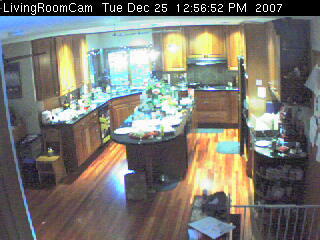 I’m moving LivingroomCam to another host so, for the moment, some things are broken. Like comments and the light control. Give me a few days and I’ll have everything working again. The cameras are not updating today because it’s over 100 here and I’ve turned off some of the computers in the house. Here in the Willamette Valley, we’re not used to weather extremes — our houses are just not built for below zero and above 90 temperatures. This didn’t use to be a problem. But now, the planet is a changing. Anyway, the updating will restart when the temperature drops below 90 which will be in a day or two. I have the cameras working again but the Audiotrons aren’t available. But, no fear, you can still make the lights change. We will wave. I moved servers around the network and broke the cameras. It will take me a few days to get the cameras updating again. Check back next week.